As technology develops, so does the workplace. Smart business owners and managers are always looking to implement new strategies and processes with tools that increase project execution, workplace productivity, efficiency, cost-effectiveness and safety. For manufacturers, retailers, grocers, educators and event management teams, sign hanging systems and visual displays play an important role when conducting business. However, the traditional sign hanging process is far from productive, efficient, cost-effective and safe. 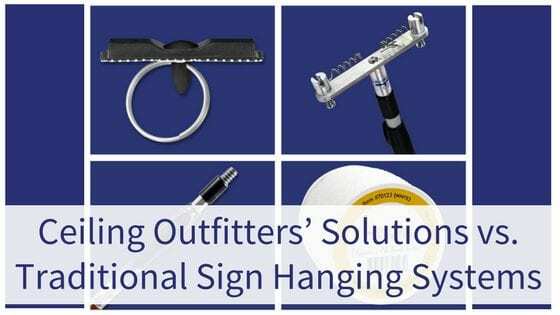 Ceiling Outfitters®, a sign hanging systems and solutions provider, offers a proven system of tools that simplifies the sign and display hanging workflow. Use the right tools for the job and eliminate ladders or lifts, cutting and fastening cable while perched on a ladder using cumbersome tools, joining multiple lengths of unsightly metal or plastic double “C” hooks that can easily disconnect or tying connecting knots or crimping cable to the visual display. Hanging signs using outdated methods requires several staff members. One to measure, manipulate and cut the connecting cord such as string, monofilament or steel cable (possibly with frayed ends) then connect it to the sign with hooks, crimps and knots. Once the cable is attached, the sign is ready to be hung using more connectors and crimps. Bring in employees two and three to tote the ladder into place, climb the ladder, and steady the ladder so employee two can hand the signs to the one who is balancing precariously on the ladder using tools to attach the cord to the ceiling. A number of things can go wrong during this unnecessarily complicated process, making it inefficient and unsafe. If the cords are not cut or crimped evenly the sign will not hang level. Often times uneven signs are not noticed until it is already hanging from the ceiling and the tools have been put away. However, top-of-the-mind during this process is a workplace injury. Heading up and down a ladder or lift several times is risky without external stimuli. Add carrying the sign up the ladder and connecting the cord to the ceiling, and you’ve got a recipe for disaster. Other safety concerns include injury when using frayed metal cords, sharp scissors or wire cutters, and other necessary tools. Is the inefficiency of this process worth the risk, time or trouble? Certainly not; especially when innovative sign hanging products from Ceiling Outfitters are available at a competitive price. For this reason, a number of large, well-known companies have made the switch to Ceiling Outfitters’ products. 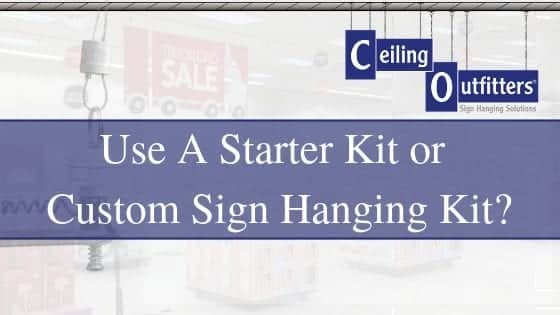 Ceiling Outfitters sells a number of sign hanging systems and accessories that work collectively to help quickly, easily, and safely hang ceiling signs. The leading sign hanging system in the industry is the Clik-Clik™ Magnetic System. It’s components, which includes ClikMagnets™, the installation MagPole™, MagMover™, and LoopLine™ work together to make use of sign hanging systems FAST, SAFE and EASY. Here is a summary of the right tools for the job. ClikMagnets are plastic coated, permanent neodymium magnets that adhere to any metal surface containing iron, including drop ceilings, open industrial beams and roof decking. These magnets replace historically used ceiling twist on clips or cumbersome, unsightly and large warehouse-ceiling hooks. We offer four magnets with pull-strengths ranging from up to 3 to 20 lbs. (1.4 kg to 9.1 kg). ClikMagnets are reusable and will not lose their magnetism unlike ceramic magnets which have a lower force rating of BH Max 3 as compared to our rare-earth magnets rated at BH Max 40. The MagMover attaches to the end of the installation MagPole™ which together transports the sign and ClikMagnets to the installation point on the ceiling and then retrieves it when changing signs. There are five models to choose from including the Single, standard Dual, the Adjustable 24” Dual, fixed 24” Dual and the eight-station Multi MagMover™. The synergies of this and the other Clik-Clik™ components work together to reduce the time needed to hang signs by up to 70%. The MagPole is a durable, professional grade telescoping installation pole. Attach your choice of MagMovers™ to simply lift the display to the ceiling for quick and easy installation. Offered in 3 models it provides access to ceilings up to 27 ft. high (7.0m) unlike competitive products which only reach 23 ft. The aluminum and fiberglass construction results in a sturdy pole that is easily maneuvered when fully extended. And, the pole won’t bow over like competitive products when loaded with a ceiling display. Extend the MagPole™ with an auto-lock push-button feature unlike other installation poles that feature the unreliable twist-locking method. LoopLine is our patented, durable connecting cord that replaces unsightly ceiling clips equipped with monofilament, string, steel cable and adaptable metal or plastic “C” hooks. Configured with two-inch repeating loops, LoopLine connects the ClikMagnet™ to the ceiling display without tying a knot. Simply looping the line back through itself makes the connection quick and easy and allows for easy removal and reuse when changing signs. Signs hang level when each line has the same number of loops. Today, it is the only product of its kind that is available on the market, and is used around the globe by retailers, grocers, manufacturers and other professionals. This unique product is available only through Ceiling Outfitters. 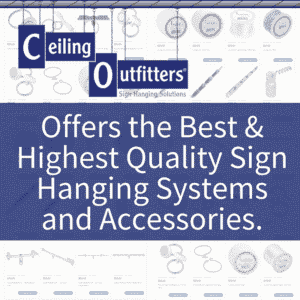 Ceiling Outfitters provides additional ceiling accessories for connecting displays to the ceiling. 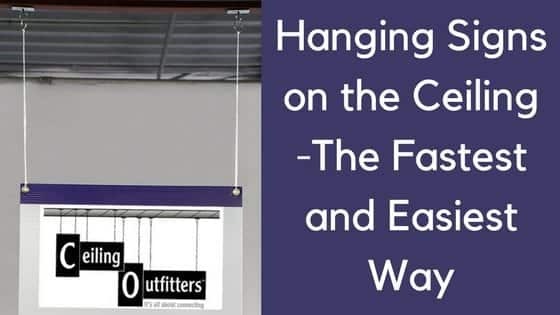 The UrbanTrapeze™ creates a connecting loop in steel cable for heavier ceiling signs without using a crimp. Simply push a button to level the display or incrementally adjust its height from the floor. The E-Z™ Banner Hanging System products provide a finished look to the top and bottom edges of graphics. These rigid extrusions securely hold the graphic in place, provide a connection point to the ceiling and improve the visibility of the printed message. Use Miracle-Sticks® to attach small signs to glass, metal, wood, plastic surfaces or floor displays and easily remove the sign without leaving adhesive residue on the attaching surface. We offer the best and highest quality sign hanging systems and accessories available on the market. 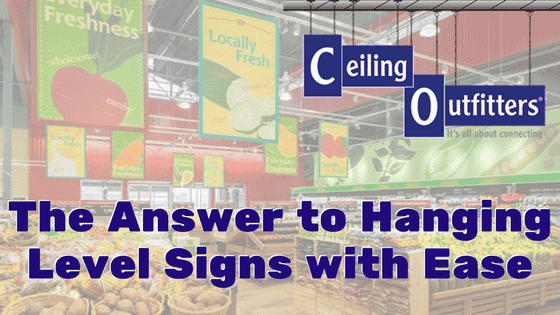 Our customers rely on Ceiling Outfitter’s years of experience for solutions to their sign hanging challenges. Allow Ceiling Outfitters to work with you on your next project and provide the best ceiling hanging systems solutions that ensure the quickest, easiest and safest installation of your project. 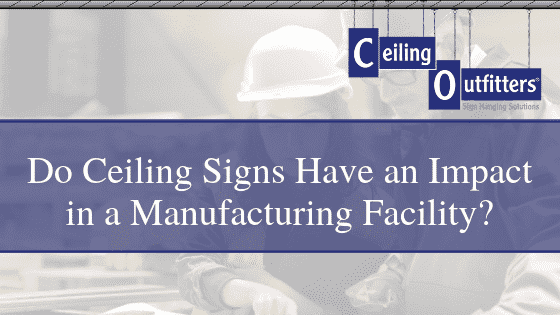 To speak to one of our sign hanging systems and solutions experts, call Ceiling Outfitters today at (972) 635-4846 or fill out this contact form on the website.